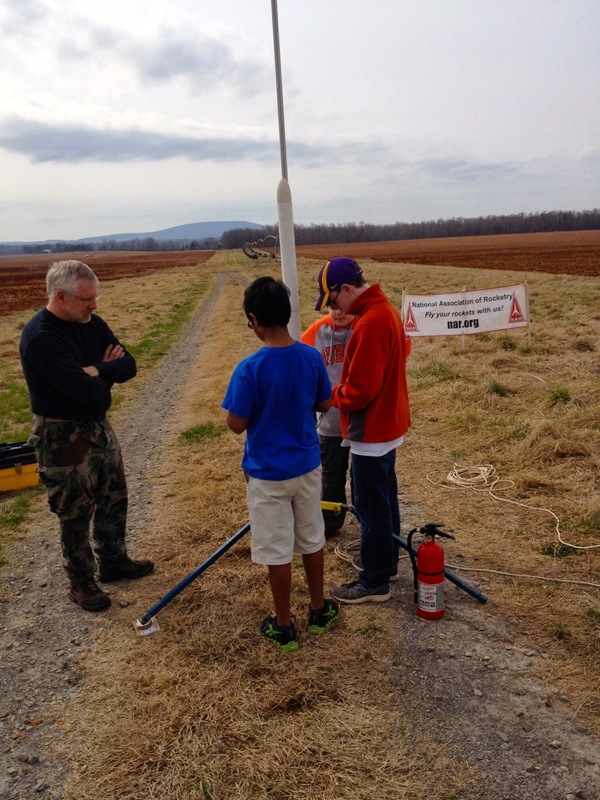 At least 9 TARC teams converged on Bragg Farms just north of Huntsville for our annual TARC regional launch. The goal is to provide TARC teams who have not had much of a chance to fly due to lack of a field or other factors a few hours practice and a chance to qualify, and to provide local teams with a chance to get in a bit more practice and hopefully make a qualification launch or two. There is also the added bonus that each team can see what sort of rockets the others have devised and compare notes. For the past couple of years, the weather has sucked – way too windy – but today, it was great, with light and variable winds and a high, hazy cloud deck that let in some sun, but not too much. A perfect day to fly rockets! The crowd at just past 10 AM. Duane and I arrived at the field just before 10 AM, and there were already quite a few folks there. 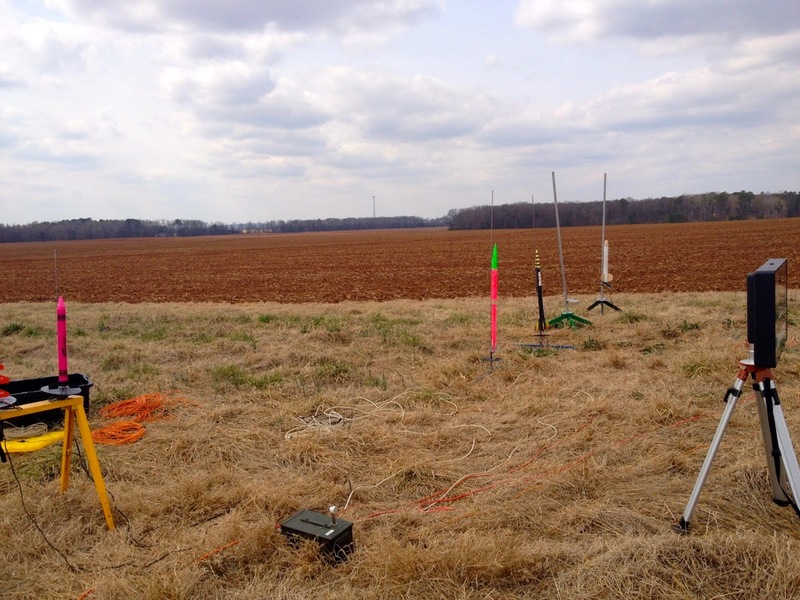 Chuck, Vince, and Dan were hard at work setting up the range, which consisted of a metal sawhorse converted into a pad capable of launching 3 low power Estes-style rockets, and a couple of mid power pads with the standard 6 foot, quarter inch diameter rod used in TARC. A few teams – Falcon, John Paul II, and Liberty – insisted on using their own pads, as their rockets were built to use rails. All rockets were launched from a range table using the usually reliable HARA launch system. However, today we had a bit of a problem; two of the three battery/relay boxes used to supply power to the pads turned out to have really bad off batteries, forcing us to rely on just a single battery/relay box. Only a minor inconvenience, but it did emphasize that the club needs to do some maintenance on the launch system. their rocket ready to launch. Today was like watching a NASCAR race. Numerous TARC rockets took to the air, with all the successes and mishaps that accompany a big launch. There were several flights that hit the duration goal spot on, turning in flight times of 48 to 50 seconds, but no one was close to the altitude mark of 825 feet. Some were too high; others too low. A couple even had trouble getting off the ground – Liberty Middle’s rocket had an explosive engine event at ignition (CATO to those in the rocket trade) that set their rocket on fire. Another team had an ejection charge fire prematurely, deploying the parachutes before the rocket left the launch rod. Another team’s rocket was unstable, tracing loops in the sky. And so on, throughout the afternoon. I was kept pretty busy, timing rocket flights and helping debug igniter issues. Vince, my partner in crime and NAR board member, launched the birds, timed the flights, and helped fill out the score sheets. I got to do the math, as no one had brought a calculator (yes, we had cell phones, but it was easier to bug me, as I still like to work arithmetic in my head). It was not just TARC rockets taking to the air; there were also a few flights of rockets belonging to club members. Dan Cavender wowed the crowd by flying his gorgeous Pegasus scale model to over 3000 feet using a K motor (the only high power flight allowed today). Unfortunately, it was the mandatory sacrifice demanded by the rocket gods, who directed it into a tree for their great pleasure. Efforts were still under way to retrieve it when Duane and I left the field around 3. Elliot, our club’s VP, flew the most rockets. His Estes Black Star Voyager, Cosmic Interceptor, and Interceptor E were crowd pleasers, though there was a bit of consternation when the ejection charges seemed late on the Voyager and Interceptor. They were heading down and getting uncomfortably close to the ground before the chutes deployed. He flew a couple of multi-stagers, the Estes CC Express and Comanche 3, both maxed out on the power with D and C motors. I don’t know if he ever recovered the upper stages, which flew pretty much out of sight, though the CC Express did drop a spent D motor casing on the hood of Vince’s car. Sometimes I think our rockets feel they need to behave like birds :/ Elliot also launched an Aerotech Astrobee semi-scale twice on G motors, which left the pad with a very satisfying roar. He ended the day with a couple of Dr. Zooch rockets – the Mercury Redstone (which suffered a melted chute, but fortunately no damage) and a Soyuz. crayon rocket is at left, the fins of Elliot’s Comanche 3 just barely visible. And me? I had brought seven rockets to fly, thinking that I would have some time (dumb, huh?). However, I did manage to launch three. The first, my Estes Pulsar Pink crayon rocket, drew some snickers from the crowd as it lumbered skyward on a B6-4, even falling backwards a bit before chute deployment. Can’t really blame them; even I thought the thing flew like a pig. Maybe a C motor next time. My Centuri Quasar clone was next, on a C6-5. It flew beautifully, landing softly on the field about 50 yards down wind. I ended my day with a flight of my Estes Avenger clone (a 2 stager) on a C6-0, B6-4 combination; it also flew well, and I got some great video from the camera strapped to the side of the upper stage. We closed up shop around 2:30 or so. Right now, it appears that only the Falcon Rocketeers have a set of scores that MIGHT get them to the TARC Nationals, though some teams have yet to finish all three qualification flights. Time is running out, and all scores are supposed to be at TARC HQ at month’s end. It would be nice if some other team in the area also posted a good set.